Hanoi (VNA) – Prime Minister Nguyen Xuan Phuc received First Vice President of the Cambodian Senate Nay Pena in Hanoi on August 9, suggesting that Vietnam and Cambodia should strengthen their solidarity and friendship, and support each other’s legitimate interests amid complicated developments in the regional and global situations. The PM welcomed the Cambodian delegation’s official friendship visit to Vietnam at a time when the two nations are celebrating the 50th founding anniversary of diplomatic ties (June 24), describing it as vivid evidence of their growing relations. First Vice President Nay Pena said his visit conveys a message about the two countries’ sound relations. On behalf of the Cambodian leaders and people, he thanked Vietnam for its wholehearted support to the Cambodian people in the fight against the Pol Pot genocidal regime. He informed about the results of Cambodia’s commune/ward elections last June, in which the ruling Cambodian People’s Party (CPP) won a big victory. In recent years, Cambodia has achieved an annual average growth of 7 percent, making it a middle-income country, he said. The Cambodian leader also briefed his host about the outcomes of his earlier talks with Vice Chairwoman of the National Assembly of Vietnam Tong Thi Phong, during which the two sides shared experience in promoting socio-economic development and parliamentary cooperation. PM Phuc stressed that the Government and people of Vietnam are happy to witness the enormous and comprehensive achievements that Cambodia has attained over the past years. Cambodia’s prestige and position have continually been improved in the region and the world, he said. The PM congratulated Cambodia on the results of the commune/ward elections and expressed his belief that the upcoming general election would be a success. He also believed that under the judicious reign of King Norodom Sihamoni and the leadership of the Senate, the National Assembly and the Government of Cambodia, the Cambodian people would continue obtaining even greater accomplishments in building a country of peace, stability and prosperous development. The Vietnamese leader also noted with pleasure the continuous development of the traditional friendship and cooperation between the two countries, which have brought practical benefits to their people. Economic, trade and investment relations are growing strongly, making Vietnam one of the leading trade and investment partners of Cambodia, he noted, asking both sides to do their best to soon raise bilateral trade to 5 billion USD. He also underlined the need to increase people-to-people exchanges, especially between the youth, and enhance coordination among relevant agencies to soon complete the land border demarcation and border marker planting, thereby helping to build the shared borderline of peace, friendship, cooperation and development. 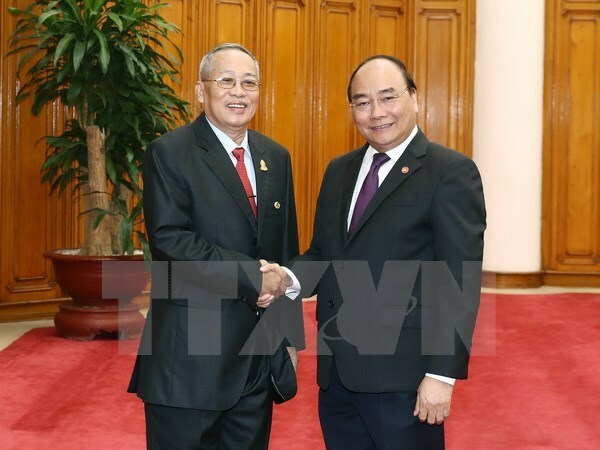 PM Phuc also called on First Vice President Nay Pena and the Cambodian Senate to further help Vietnamese-Cambodians stabilise their lives in the country so that they can contribute to Cambodia’s development and the good neighbourliness between the two nations.